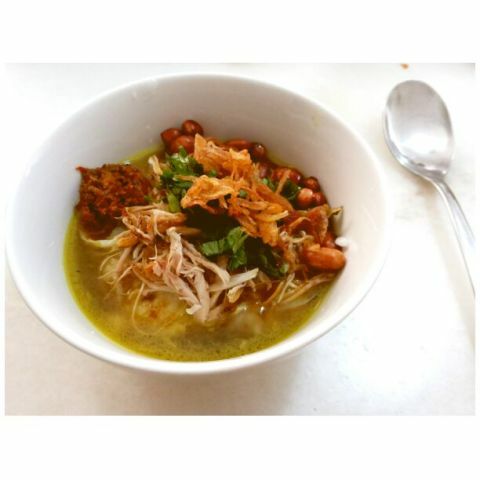 Chicken Porridge with yellow soup or soto soup or called Bubur ayam kuah kuning in indonesia is one kind of indonesia famous breakfast. I have it often for breakfast bought from a stand near my office. Really delicious. So, i try to homemade it. Hmm, need a lot of ingredient, most of them are indonesian spice. But don't worry, it easy to make despite have so many ingredients to make. The taste just 60 percent same with sold one. 2. in a wok, saute lemongrass, lime leaves, bay leaves, galangal with seasoning ingredients until aromatic. 3. Add in chicken,salt, sugar and water. Cook until chicken is cooked. 5. Fries the chicken. Let it cool and shredded it. 6. Now, Chicken porridge ready to serve. Take a bowl of porridge, pour in yellow soup, topped with shredded chicken, peanut, sweet soy sauce and others according to taste.